This is your brain: cluttered, disorganized, nerve-wracked, unproductive. This is your brain on WorkFlowy: neat, orderly, calm, effective. I didn't realize how much I needed this free Web-based organizer until I started using it. Five minutes in, I was hooked. WorkFlowy is just that good. After signing up for an account, you're presented with an almost entirely blank page. To get started, create a heading for something: a project, a goal, ideas, your daily to-do list, or whatever. Then press Enter, followed by Tab, and type your first entry. After a couple entries, you'll the get the knack: Workflowy is little more than an outliner, but one that's fast, easy, and unobtrusive. 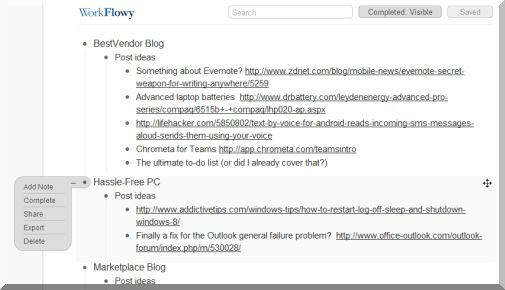 WorkFlowy also has basic sharing features, not unlike Google Docs, so you can invite others to view and/or edit your list(s). I've already started using the service to organize my work projects and ideas, but I can see it being a huge benefit for some personal lists and goals as well. It's great for brain dumps, by which I mean putting everything down "on paper," then organizing it to your liking. WorkFlowy is simple, effective, and free. What's not to like? WorkFlowy is so powerful and polished, you just might be able to use it to outline your entire life.